One of the most requested features was for Ultimate Windows Tweaker to have a Search functionality that would let users easily search for the over 250 tweaks that the popular tweaking software has to offere. We are happy to say that Ultimate Windows Tweaker 4.3 now lets you easily search for tweaks and even jump to the tweak with a few clicks. 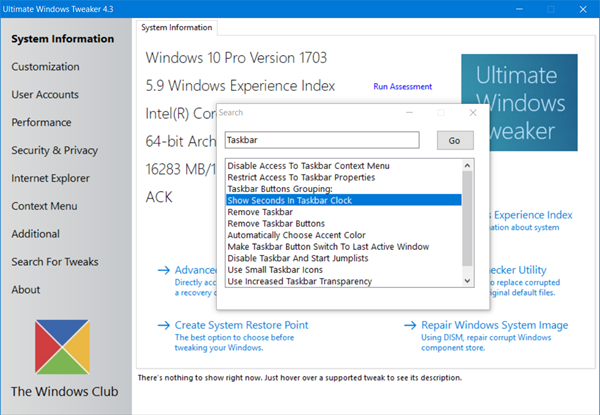 Ultimate Windows Tweaker letws you tweak your Windows 10 and personalize your computing experience. With judicious tweaking, it can make your system faster, more stable, personal and more secure with just a few mouse clicks. It even lets you create a system restore point, run System File Checker, repair system image using DISM, access Advanced Recovery Options and run PC Assessment, with just a click of the button. Many design improvements and lots of bug fixes. To search for a tweak, click the Search For Tweaks link in the left panel. Rhe Search box will open. Enter the keyword or keyphrase and click Go. All the relevant links will be listed. Select and double-click on the tweak you want and UWT will display the tweak right away. If you are using Windows 10, you definotely want to download Ultimate Windows Tweaker 4.3 from its official homepage.